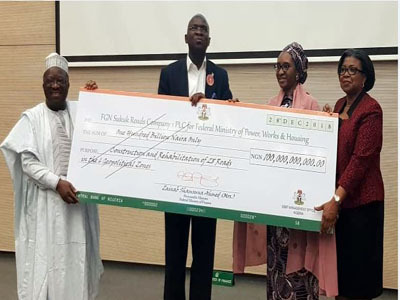 The Federal Government has released N100 billion Sovereign Sukuk bonds proceeds will be used to construct 642.69km roads across the nation, Minister of Power, Works & Housing Babatunde Fashola, said at the presentation of the cheque by Finance Minister Mrs. Zainab Ahmed, in Abuja yesterday. According to Fashola, the money has been shared equally among the six geo-political zones, with each region having N16.67 billion for the number of roads to be completed in its jurisdiction. Six roads will be constructed in the Northcentral, five in the Northeast, four in the Northwest, four in the Southeast, six in the Southsouth and three in the Southwest. Some of the road projects are: Dualisation of Abuja – Abaji – Lokoja Road: Section I (International Airport Link Road Junction-Sheda Village Junction) in FCT Contract No.5862. Fashola explained: “Specifically, it will be wearing course, reconstruction of existing carriageway, stone pitching, kerbs, drainage and outstanding variations (NGN464, 806,419.09) to be handled by Dantata & Sawoe Construction Company Nigeria Limited (Northcentral). “For the Northeast, the dualisation of Kano-Maiduguri Road, linking Kano-Jigawa-Bauchi-Yobe and Borno states Section III (Azare-Potiskum), in Bauchi State, Contract No.5880 will be handled by Mothercat Limited. “The project will cover wearing course, pipe culverst, trapezoidal and rectangular drains, new jersey barrier, bridge works, 4-way cable duct, road furniture and protection works. “For the Southeast, it will be the rehabilitation and reconstruction of Enugu-Port Harcourt Dual Carriageway Section II: Umuahia Tower-Aba Township Rail/Road Bridge Crossing (CH. 120+500-CH. 176+600) in Abia State Contract No.6209 to be handled by Arab Contractor Nigeria Limited. The job entails laterite fill, laterite sub-base, sand/cement base, crushed rock base, wearing course, asphaltic binder course, asphaltic wearing cource and concrete median. “In the Southsouth, the dualisation of Yenegoa Road Junction – Kolo – Otuoke – Bayelsa Palm (20km) in Bayelsa State with contract No.6248, will be handled by CCECC Nigeria Limited for the Excavation of unsuitable materials, construction of pipe culverts, stone pitching, median kerbs, sand-cement base, stone base course, binder course and wearing course. The minister said that the impact of the Sukuk bond would be on nation building through job creation, growth and employment. The Federal Government contractors will be the first beneficiaries of the funds, which would in turn, trickle down to suppliers of building materials, artisans, miners and steel companies. The proceeds will be disbursed on the construction and rehabilitation of 28 key economic roads captured in last year’s budget. The roads to be funded with the Sovereign Sukuk Fund, the Finance minister said, “will ease commuting, spur economic activities across the country and further close our infrastructural gap”. GOD BLESS OUR PRESIDENT MUHAMMADU BUHARI for all the numerous and good projects he is doing in our country. Unarguably, This is simply the best president in the history of Nigeria. We pray for Good health, wisdom, knowledge and understanding for him as he takes us to the land flowing with milk and honey, AKA the NEXT LEVEL . Wailers, children of hate and perdition, you can keep wailing for as long as you live. Little by little the islamisation agenda is working out while our pastors are more interested in collecting tithes. Even though i don't support Buhari, but the truth is...majority of the federal roads in Nigeria at the moment are not so bad. Work has been going on in all federal roads across the country. Why just 3 in southwest? OK, each zone gets #16b of the Sukukk loan. But, how many kilometres of roads can #16b actually construct in a zone of six states? Rubbish! They just put sukuk sign everywhere but no road is being built anywhere . I took a round trip this January (East, South and West) mostly by road, no road is being built anywhere. Where are the Biafrans groom by the PDP to make more noise ? Okay Ooooo. BTW, what's sukuk? One of them is right above you bro! I don't have problem with a government borrowing for developmental projects. For these who don't travel, if you see any of these six roads done with the last Sukuk fund, you will be tempted to sleep on it. Bottom line: shut up and stop hating for no reason. If only PDP govt. had been this focus and sincere for 16yrs our roads would have been the best in Africa. I even saw Otuoke road in Bayelsa. Jona ooooo. #100B not 1 single indigenous construction company.....very very bad! Atiku can't win. Start getting used to that! President Buhari will be in charge till 2023.
quote author=Maket post=74649393]Another roads development.